Summer is holding on firmly to Southern California. We are headed into record breaking heat early next week. This is the time of year when it is not uncommon to hear folks say, “This has got to be the last heat wave before it starts cooling down,” only to have to say it again in the next week. So, instead of cleaning out beds and turning soil, I cross my fingers and hope the winter squash vines hang on, make it through the heat long enough for the second batch to ripen. I worry that the seeds I planted in the four inch pots won’t stay moist enough and fail to germinate (I am already on my second try). 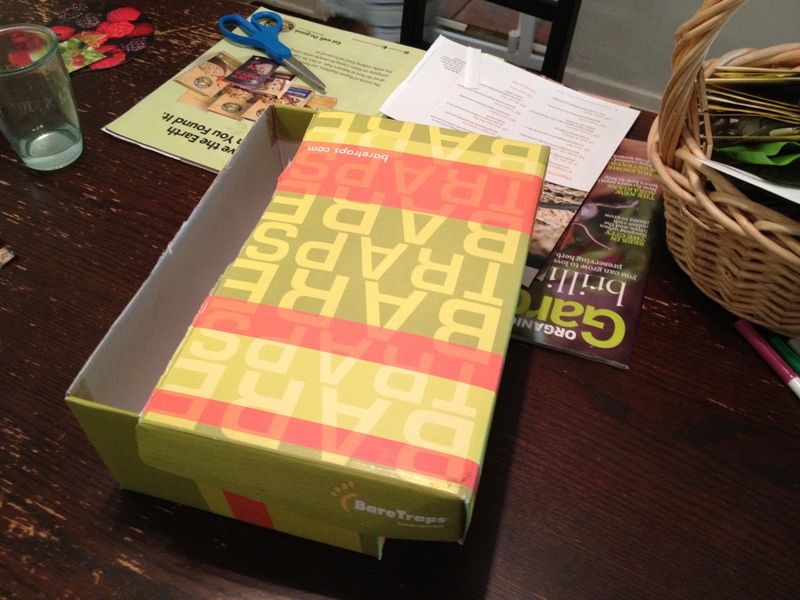 As temperatures soared above 100 degrees a couple of weekends ago, I stayed closed up in my cool house and finally took on a small project that had nagged at me every time I pulled my seed (shoe)box out. 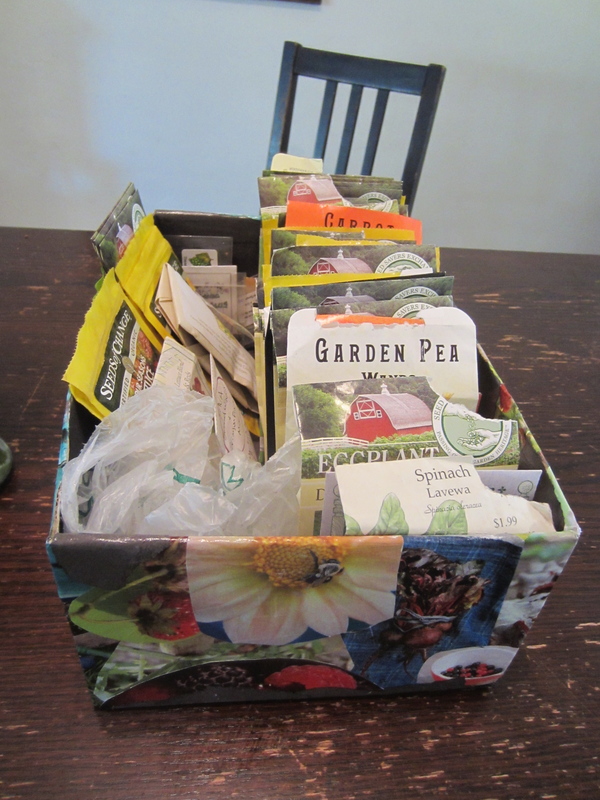 My seeds lived in this box for at least a year. They moved there from another, smaller, shoebox. The box irritated me every time a pulled it out. The lid didn’t close and I the colors were so unappealing. 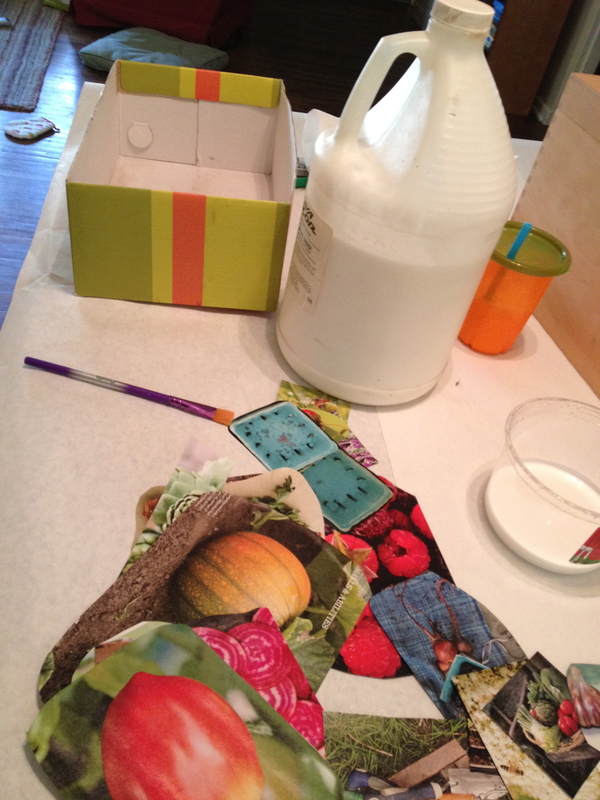 As we sat there holed up, drapes drawn, I realized it was a perfect day for some decoupage. The whole family got involved. 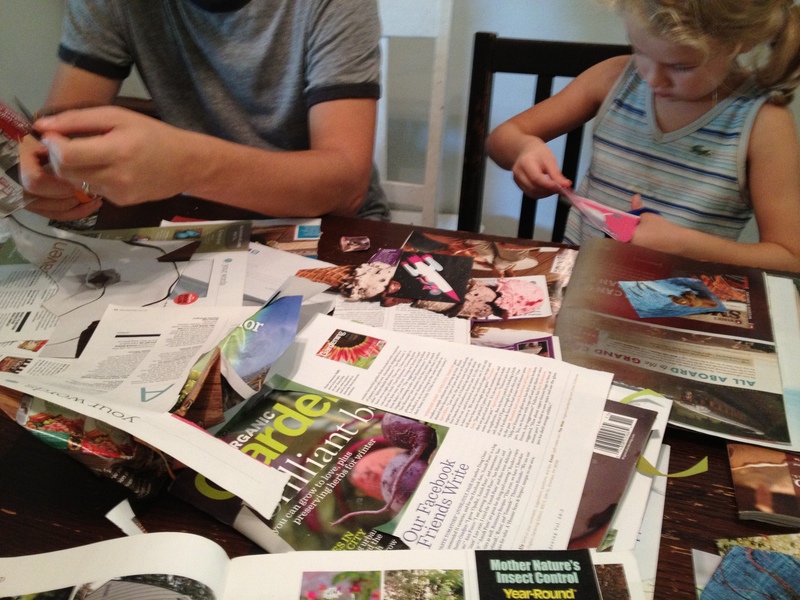 My youngest sat on my lap as I leafed through magazines. Got out the acrylic medium that had been sitting in the garage for (ahem) years and got to work. An hour later I had all four sides covered. Over the next couple of days, I did the inside and the bottom too. 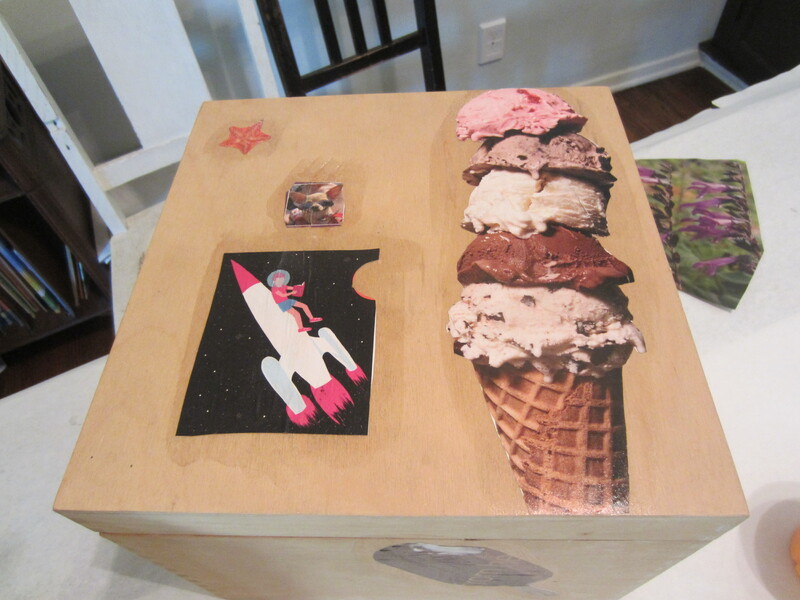 My daughter did her own decoupage project on the wooden box that holds her Lego creations she wants to save. Note, she did not choose any of the lovely photos of vegetables ;). I am crossing my fingers that this next heat wave is our last for this year. Those of you in cooler places, please send your breezes my way. I love decoupage! I went through a phase where I papered pencil boxes and anything with square corners, but that was long ago when my kids were small. I’m inspired by this to try again! We’ve got cool, wet weather here – will try to convince it to head your way! I can see how it can become addicting. 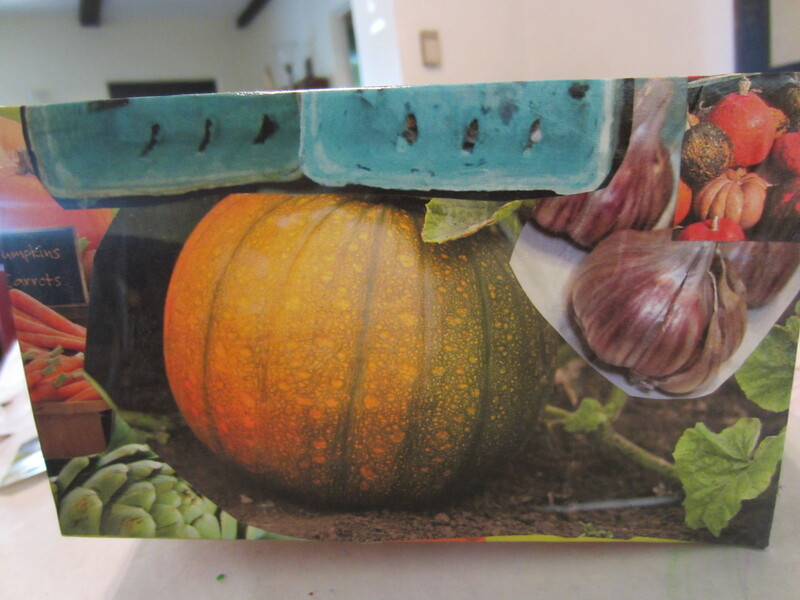 I am not a very crafty person, but decoupage is so easy. I think I would do it more, but my daughter hates having sticky hands. I hope you are successful in convincing the cool wet weather on making its way down here ;).